60 days, dropped, naked, on an island. Though, with some safety supports in case he got really sick. I imagine that after Bear Grylls shows, they had to be a little more upfront about what was actually there and what wasn’t – some of those scenes where he declares ‘I am completely alone’ and yet you’re wondering who is filming him from that angle 60 feet up a tree. Stafford clearly explains he is self filming, but has a designated drop point where he will put filled up memory cards. On another island, 8 miles away, is his emergency rescue team. You might think that 60 days isn’t that long to be completely alone. Though of course how often do we even manage to be alone for even a few hours, let alone a whole day. This meant that very quickly he began to realise his mental health was going to be as important as his physical. Books like this you enjoy for the escapist nature of them. It’s great that he’s living on a tropical island. It’s a nice idea, but the challenge is that you get dragged down into dealing with the day to day challenges. For him, it’s the thirst, hunger, and the physical discomfort of his drafty cave. When it came to writing up the book, he was able to look back and celebrate the sunsets. In many ways this is a good metaphor for our own daily lives, where we do have beauty and special moments, but the challenge is to enjoy them, without being distracted by the day to day annoyances of life. This book follows a traditional narrative arc. He gradually gets better at catching food, water, and improving his shelter. However the whole way through he talks about how much he missed his partner, and questioning why he decided to do it. The book then takes an interesting turn in the epilogue section. In many explorer books, the woman at home is celebrated, and yet at the same time you wonder if he loves her so much why did they leave them alone for so long. 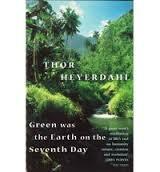 A good example is Thor Heyerdahl. A legendary explorer, Kon Tiki Voyage and other mega adventures. I love Heyerdahl’s adventures, but the whole time I read his books I wondered about the partner and children that he left at home for long, long periods of time. In his autobiography too, as he sails through the fascinating stories of his life, there is always a trusty woman at home. His rock etc, etc, and then you realise, with no explanation, their name has changed, and he’s married to someone else. I mention this because Stafford’s book is different to this. Plot spoiler, if you don’t want to know what happened after the show, stop reading. Up to this point, his story was quite normal, in an extreme adventure sort of way. Then there is a break in story, followed by a large number of tally marks. Time has passed, and, suddenly … his girl friend is calling the doctor. Turns out he is having a nervous breakdown. Then you get the big reveal. Reading the book, you do wonder why he wanted to be away from everyone for so long. Yes we like the idea of it, but we don’t actually, really, want to be gone for so so long. I’ve been home alone, completely alone, (yes it was a long long time ago), and after less than two days I was talking to the cat more than necessary. Stafford’s psychologist is summonsed from Chiswick and tells him that it’s more normal to react in this way, a post traumatic stress reaction. He then speculates that maybe he wanted to do all of his extreme challenges (he also spent 2 1/2 years tracing the route of the Amazon) because he was adopted. At which point you put your hand to your head and say doh! Of course it all makes sense, but still a pretty extreme way to deal with it. I think this is why we enjoy travel books. They are great stories, they inspire us, and they also help to give us a point of reference to look at what we do have around us now, and to try and value appreciate this. We will never be as rich or successful as someone else might appear to be, but it shouldn’t matter so much to us, and our own inner peace / calm / serenity / sense of perspective. I’ve yet to find the whole series yet online, but here are some snippets from the show.